← Come to the Pub in 2009! When John Grimes turns 14, he knows it’s time to make a choice. Will he follow the Lord, or will he follow his appetites? People have told him for as long as he can remember that he will be a preacher when he grows up, just like his father, but he’s not so sure. His father is cold and favors John’s hell-raising brother, Roy. Kneeling before God would mean kneeling before his father, and this is something he refuses to do. James Baldwin’s semi-autobiographical novel, set primarily in 1930s Harlem, depicts John’s spiritual struggle, and it is John’s thoughts, expressed by an omniscient third-person narrator, that frame the novel. In the middle section, we step inside the prayers of John’s aunt, his father, and his mother. We learn what circumstances led them to behave as they do and why John’s father is so cold. 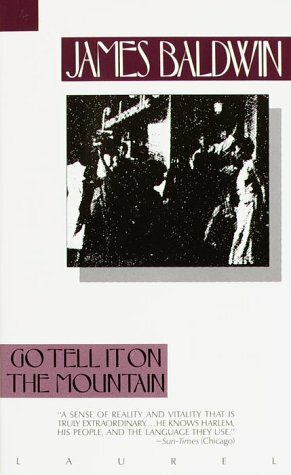 Although Go Tell It on the Mountain is sometimes pigeon-holed as an African-American novel, the central themes are universal—family relationships, struggles against the evil within, learning to forgive ourselves and each other, and accepting both God’s grace and the consequences of our actions. The spiritual life as depicted by Baldwin is messy, but it’s the way of truth. Even when God’s preacher is depicted as the worst sort of hypocrite, God’s Spirit is active here. It drives me crazy when authors try to blame God for the wrongs of his people, and that’s not the case here. Baldwin’s story is honest, sometimes blunt, but it’s no diatribe against God, or even against his flawed servants. Even the most despicable character is given an inner life, and his actions make a certain amount of warped sense. This is a profoundly moving novel, one that will stay with me. It’s short, but not a book I would recommend zipping through. There’s so much going on in each character’s words, in the Biblical references, in the way the various character’s motives are revealed, that this book is meant to be savored. Save it for when you can devote a few long stretches of time to it. The prayers read best if they’re read without interruption, and each one requires time and attention, but it’s worth the effort. This book qualifies for the 1% Well-Read Challenge (3 down, 7 to go). This was the first James Baldwin book I ever read and I loved it. I read most of his books as they came out years ago, I still have them in my library and would never give them up. They hold such good memories for me. Thank you for reviewing this. I do get tired of seeing only the latest releases blogged about. I love oldies but goodies when it comes to books. Jenny–The interesting thing about this book is that race is often just an undercurrent, which surprised me since Baldwin is often grouped with Richard Wright and Ralph Ellison, and race is absolutely in the forefront of their books that I’ve read (those being Native Son and Invisible Man). Race is relevant to Go Tell It, but the internal conflict within the family and community is the primary issue here. In fact, the character talks the most about race is John’s father, the least sympathetic character in the book. Hmm. I’d like to read this now. Perhaps it’s in my local library.